The last of the Scenic Bikeway videos we filmed last year has been released! The Tualatin Valley Scenic Bikeway is unique in that it is in Portland’s backyard and is probably the most easily accessible among the bikeways. One of the aspects we are most proud of about the video is incorporating transit into the tourism experience! Long time readers know that we are huge fans of mixing modes on bike trips. In fact our first ever bike tour involved using Amtrak to get out to Central California and ride out through wine country around Solvang. 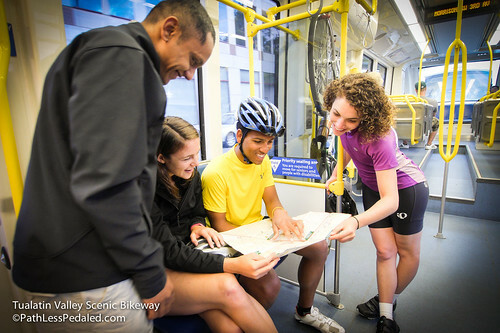 Transit is an often overlooked asset when it comes to tourism and especially bike tourism. It is one of those things that gets lumped into the “quality of life” silo of residents and is not viewed as something that would be appealing to outside visitors. Personally, when we are on a bike vacation we want to be riding a bike and not driving a car. For us, a successful bike destination allows the visitor to travel to, from and around the region with a bike without having to drive. This means a system of regional buses or trains that accommodate bikes without hesitation. When we’ve brought up the importance of transit in a tourism context at conferences in the US we get some odd looks. However, if you think about the prototypical romantic post-college European travel experience of hopping trains, subways and buses that all occurs on…you guessed it transit! Or in more simpler terms: one person’s transit system is another persons tourism experience. If you live in Portland or are visiting town, the Tualatin Valley Scenic Bikeway is transit accessible with a bike. We loved working on this video because it highlights some great assets in the region like the Banks-Vernonia Trail (one of the best in Oregon) and the relatively new Stub Stewart State Park (which incidentally also has some single track for mountain biking!). However, we are most excited because it shows what we think could be a successful model for bike tourism in the future – a fluid incorporation of travel modes. On a macro scale, imagine if Amtrak got its act together and allowed more roll-on service to identified biking and outdoor destinations; or if all regional bus carriers had bike racks and more sensible bike policies? The beauty of this is that would not only benefit local residents but make travel by outside visitors with bikes easier and more enjoyable! One can dream and this is our small contribution to that bigger vision.